Extrusion of SO2 from Heterocyclic Compounds, Part 2: Five-Membered Rings (R.A. Aitken et al.). Methyl 2-Benzoylamino-3-dimethylaminopropenoate in the Synthesis of Heterocyclic Systems (B. Stanovnik). Three-Membered Ring Systems (A. Padwa, S.S. Murphree). Four-Membered Ring Systems (J. Parrick, L.K. Mehta). Five-Membered Ring Systems. Thiophenes & Se & Te analogs (J.B. Press, R.K. Russell). Pyrroles and benzo derivatives (R.J. Sundberg, P. Van Nguyen). Furans and benzo derivatives (C.W. Bird). With more than one N atom (S.A. Lang Jr, V.J. Lee). With N & S (Se) atoms (R. Tanaka, I. Shinkai). With O & S (Se, Te) atoms (R.A. Aitken). With O & N atoms (G.V. Boyd). Six-Membered Ring Systems. Pyridine and benzo derivatives (J.G. Keay, J.E. Toomey Jr). Diazines and benzo derivatives (D.T. Hurst). Triazines, tetrazines and fused ring polyaza systems (D.T. Hurst). With O and/or S atoms (J.D. Hepworth, B.M. Heron). Seven-Membered Rings (J.M. Kane, N.P. Peet). Eight-Membered and Larger Rings (G.R. Newkome). Subject Index. 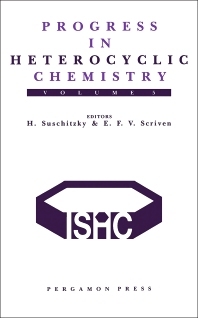 Progress in Heterocyclic Chemistry Volume 5 deals critically with original material selected essentially from the 1992 heterocyclic literature. Chapters 1 and 2 are given over to reviews: in the first, SO2 extrusion from five-membered rings is discussed by R.A. Aitken and colleagues, which completes last year's review on this topic. The second review presents a review of 2-acylamino-3-dimethylaminopropenoates in heterocyclic synthesis. The chapters are arranged according to ring sizes as in the previous volumes and are supported by references, numerous diagrams and a subject index. For organic chemists involved in academic or industrial research as well as graduate students concerned with heterocyclic chemistry.